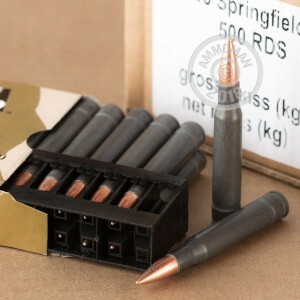 Top of the line brass cased .30-06 Springfield ammunition can get expensive really quickly, so you can save a bundle by using this steel-cased Wolf ammunition. These cartridges deliver solid accuracy for target shooting and come at an affordable price due to the low cost of steel. 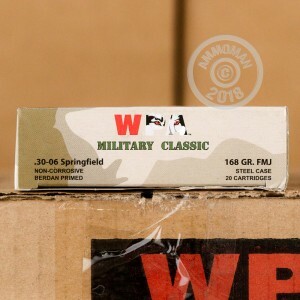 Each round in this box of 20 fires a 168 grain full metal jacket bullet. 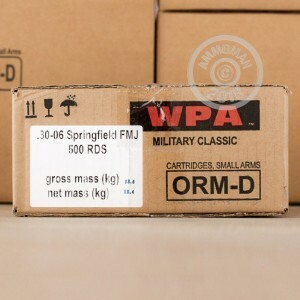 This ammo is loaded in Russia using non-corrosive Berdan primers. While the cases are non-reloadable, they come with a polymer coating and will provide reliable cycling. Place an order for $99 or more and get free shipping from AmmoMan.com--it's that easy!